What makes a hen French, anyway? It's accent? Here are a few fun things to browse: it's bitterly cold here, tucked away in the rolling pastures of the Bluegrass. Ice and snow have brought desolate news from Wall Street - but inside, we sip steaming cups of tea, curl up under blankets, and puzzle out the last few knots and tangles from our shopping lists. Right now I'm tag-teaming between "Jane Eyre" (Angie - I borrowed your copy from your bulging bookshelf) and "The Fellowship of the Ring." A blessed event occurred yesterday: I was "iced" in, and read at my leisure, until my head drooped and nodded onto my chest, and I slumbered, and the world outside slumbered with me. A local storefront serves up robust, homemade sauces, and artisanal olive oils; in fact, they know the farmers and their families by name, back in the old country. 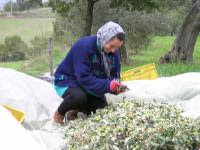 A hands-on olive harvest, I'd say. This calls for a field trip. When weather is bleak - the Rossetti bleak midwinter - it is tempting to pile a plate high with pasta, and hunker down with chums, as I did recently, to watch a movie. Especially if it's an old movie, with high-waisted pants and fast talkers - like "His Girl Friday." But inevitably, entranced by the starlets of the silver screen, I want to wear full-skirted dresses, tiny, feathered hats, gloves, and so on. And now, you can. 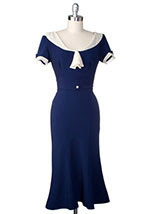 Visit modcloth.com, or monstervintage.com. Monstervintage has individual pieces, one-of-a-kind. Modcloth crafts frocks and pants in a retro style. Speaking of classic movies, I stumbled across a rather unique product today, an ode to one of the great directors, a tribute to tense, white-knuckled suspense, a trophy of terror. 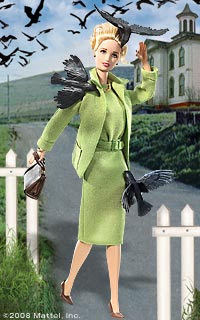 I am, of course, speaking about the commemorative Barbie for Alfred Hitchcock's "The Birds." I feel compelled to showcase this startling doll simply for the fact that throughout the afternoon, friends and relatives have been exclaiming their heart's desire for this doll. Who, it should be noted, comes complete with attacking crows. Let's hope they don't opt for a companion product for "Psycho." Since fashion keeps cropping up, let's enjoy a fireside chat about Inaugural threads, shall we? While the enthusiasm that has been gushing from the media about Barack Obama's physique has been a little, shall we say, bordering on the adolescent, there's plenty of other speculation we can indulge in about D.C. fashion: and it is interesting, simply because I've been there. At a Presidential Inauguration. Have I not mentioned that before? Well, in the year 2000, a vanload of fellow students and I made a dashing road trip from Indiana to Washington, D.C., for the now legendary (in whatever way you wish to read) George W. Bush's introduction to the Oval Office. The city was packed. Snipers lined the rooftops, and black-clad men lay on their stomachs with large guns pointed out from the dome of the Capitol building. Protesters wearing polar bear costumes marched for the environment, security checkpoints were set up to search bags, and everywhere, bone-chilling rain fell on bundled up crowds. Umbrellas got tangled in the pushing masses' attempts to navigate sidewalks. Few times have I been so cold. We stood atop some bleachers to watch the Inaugural Parade pass by, huddled, shaking, shivering. And later in the day, on the Metro? Ladies in full-length ballgowns, gentlemen in tuxedoes, standing, holding the stabilizing rails - on the subway. Because parking was simply impossible on the night of the Inauguration, many simply took the train. And so I saw gorgeous, shimmering dresses sway back and forth with the train's movement, and high heels navigated the gap onto the platform. Swank folk descended on mass transit in surprising crowds. Did you know that the new President and spouse rotate among something like eight or ten different balls and parties, at least? I don't envy Michelle Obama facing what amounts to Red Carpet fashion pressure. The First Lady-Elect has had innumerable articles penned about her style and her figure already. I'm sure she will be stunning. Especially if her ensemble comes without three black crows attached to it.